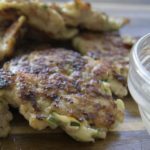 Savory patties that you can eat with a fork or as a finger food. The combination works great for a savory breakfast, lunch, dinner or even as an appetizer. The ingredients are simple, and assembly time is minimal! That works for any busy family- even with picky eaters. P.S. They might not even say anything about the veggie unless you have a picky eater who dissects the food before even a taste. Perhaps they are eating the flying saucers that the Green Goblin rode on to chase Spider Man, and he left a little of his super powers? My kids always fall for it- stories at dinner time that go with the food. Absolutely worth a try! Shred the zucchini and use about 3 sheets of paper towels (or use a cheese cloth) to set the zucchini on. Let the zucchini sit for about 5 minutes, and then squeeze the liquid out of the zucchini. Using your hands is the best method to combine all of the ingredients. If you’re not up for it, simply use a spatula until completely combined. Heat a griddle, or a skillet with a spray of olive oil. Once heated, roll the chicken mixture into about 2-inch balls and place onto the griddle and using your fingers or the back of a spoon, smoosh them down into patties. Once the edges are browned (about 2-3 minutes) turn over and cook until patties are firm and cooked through. Kids like finger foods! Dipping them into their favorite dressing is always a good way to get them to try new flavors and new foods. 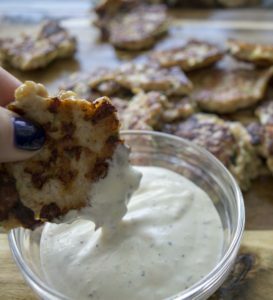 Let them pick their own patty to try, and let them choose the dressing to dip it into. Giving kiddos choices always makes them feel special. Of course, it’s always a win when they want to cook. So, have them get down and dirty and smoosh those patties!